Boat owners have been urged to take precautions as levels rise across Oxfordshire's rivers. Warning boards are being displayed along the River Thames and flood alerts are being issued across the county. Barry Russell, from the Environment Agency, said: "The Thames is rising and the flows are increasing so we are issuing red boards in certain areas". 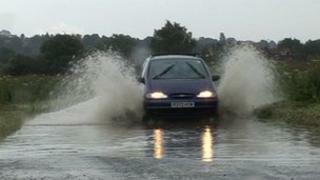 On Friday heavy rain caused flash flooding and long delays across Oxfordshire's roads. Oxfordshire Fire and Rescue received more than 50 calls. At one point Wheatley's high street area was impassable and water seeped into homes. Standing water also caused problems in areas including Garsington and Wantage. In Wood Eaton fire crews were called to help cars stuck in flood water. There are alerts on the Thame from Marsworth to Dorchester, the Evenlode from Moreton in Marsh to Cassington, and the Ray and its tributaries from Shipton Lee to Islip. The Besselsleigh Wood Festival has been cancelled "due to bad weather". And Sunday's Henley Swim, which was expecting 700 participants, will not go ahead because of safety concerns. Organiser Jeremy Laming said he was "pretty gutted". The event had already been postponed from 24 June.